The CDMA910XF Plug-In modem is an end device certified CDMA 1xRTT 2G cellular modem for use on Verizon and Sprint 2G networks. Based on the industry standard 20-pin connectors, it incorporates the Telit CDMA910-DUAL (see link below) dual band module. 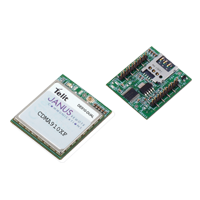 The Janus CDMA910XF is a low cost, end device certified embedded modem alternative and is pin compatible with the full line of Janus Common Footprint (XF) Plug-In products. End device certification allows users to implement the CDMA910XF in their devices with no further North American carrier certification requirements.